We study the problem of mapping concurrent tasks of an application to cores of a chip multiprocessor that utilize circuit-switched interconnect and global asynchronous local synchronous (GALS) clocking domains. We develop a configurable algorithm that naturally handles a number of practical requirements, such as architectural features of the target platform, core failures, and hardware accelerators, and in addition, is scalable to a large number of tasks and cores. Experiments with several real life applications show that our algorithm outperforms manual mapping, integer linear programming-based mapping after ten days of solver run time, and a recent packet-switched network on chip-based task mapper through which, we underscore the unique requirements of task mapping for circuit-switched GALS architectures. 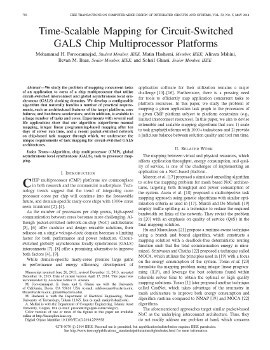 Mohammad H. Foroozannejad, Matin Hashemi, Alireza Mahini, Bevan M. Baas, and Soheil Ghiasi "Time-Scalable Mapping for Circuit-Switched GALS Chip Multiprocessor Platforms," IEEE Transactions on Computer-Aided Design of Integrated Circuit Circuits and Systems, vol. 33, no. 5, pp. 752-762, May 2014.